This is Day 9 of the First Annual 10 Days of Heat writing challenge hosted by P. J. at A ‘lil HooHaa. Today's prompt is Best Summer Memory. Please join me in checking out the other hot stories. I'm not sure if the prompt is meant to be just this summer's bet memory, or the best-ever summer memory. Either way, there is no one best memory so I'm going to walk down memory lane through some of my fondest summer memories, in no particular order. Parasailing in the Gulf of Mexico at Madeira Beach, FL. 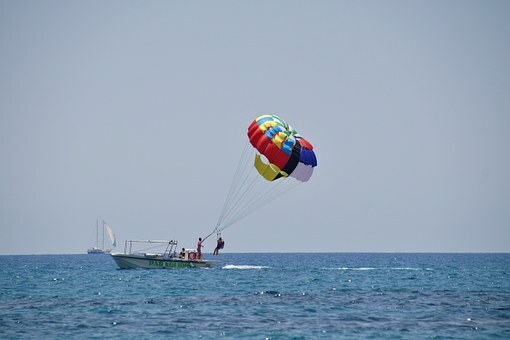 The experience takes you from flying across the water in a speed boat to sailing hundreds of feet above the Gulf. It was so peaceful up there, and the sounds of the city and boat seemed miles away. Zam's swamp tours in Louisiana. It was a slow boat ride through the bayous and back waters of Louisiana where we saw fish, alligators, turtles, Nutria, and lots of birds. After the boat tour, we got a tour of the back yard, which was filled with alligators. There was a talk, but the guide was speaking Cajun French, and I didn't get most of it. It was there we had our first taste of alligator, and we've been eating it ever since. Here is a video from an actual tour. 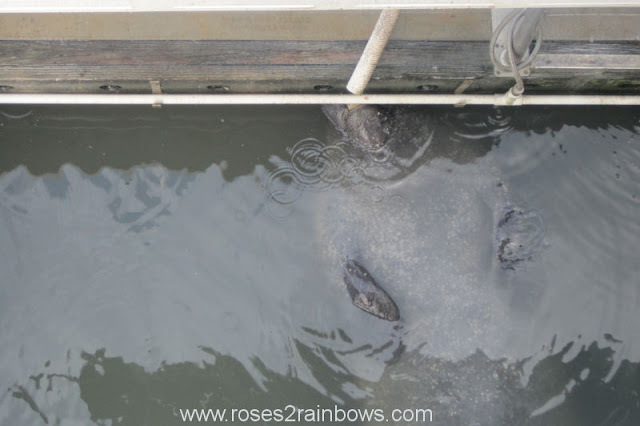 Tom and Jerry's air boat tour on Lake Panasoffkee in Florida. That was an hour-long tour which took us on slow winding paths through tall grass to speeding across the wide open expanse of the lake. It was beautiful, and yes we did see alligators, turtles, and yep, more birds. The fascination with water and boats continues. While vacationing in Maine one year, we took a sailboat tour out of Bar Harbor. 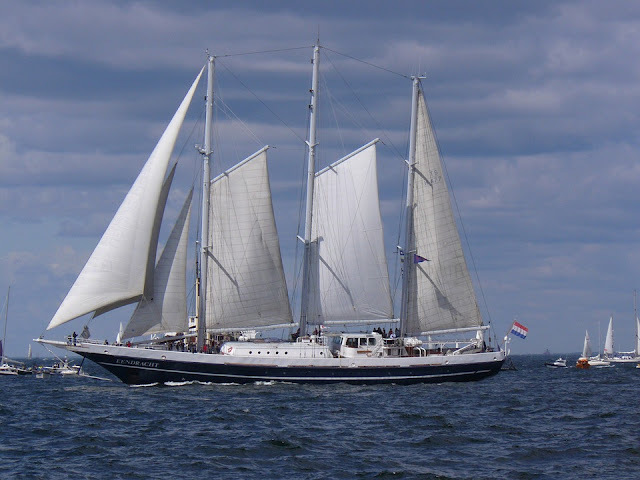 It was a large sailboat with 3-4 masts. If you love boats and you've never done a tour like this, you should. We did a similar tour in Norfolk that went around the Harbor. That was an evening tour, and it gets chilly even in the summer. Not to be forgotten was our trip to San Diego, and of course, the Pacific ocean. No trip is complete without a visit to Coronado and the famous Coronado Bridge. Are you sensing a theme here? What are some of your favorite summertime memories? We were walking along the Marsh Walk in Murrells Inlet last week watching the wildlife and enjoying a nice fall day at the beach when this fellow decided I had gotten a bit too close. I managed to catch him before he got away. Some of the other posts were resting places for gulls and cormorants. They are sometimes the victims of theft. Gulls often try to steal fish from the pelican's pouch as they drain the water after a dive, sometimes while perched upon the pelican's head. How rude! 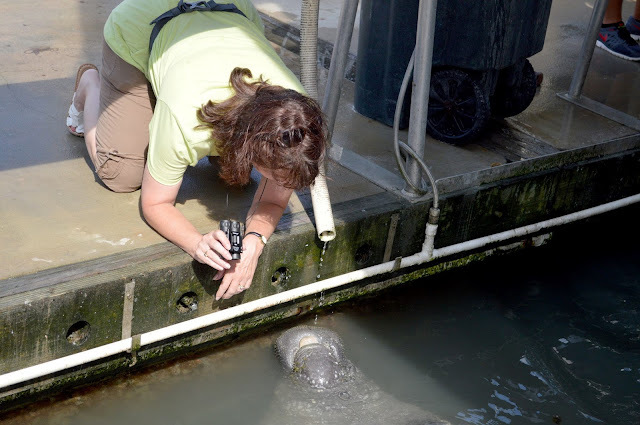 Pelicans incubate their eggs by standing on them. When startled, a hasty takeoff can cause them to crush their eggs. 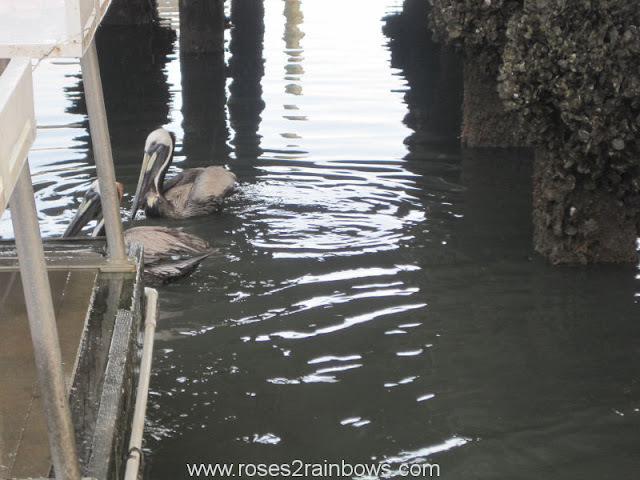 Brown Pelicans are only one of two species of Pelicans that plunge dive for food; the other being the Peruvian Pelican. They live on both the East and West coasts. 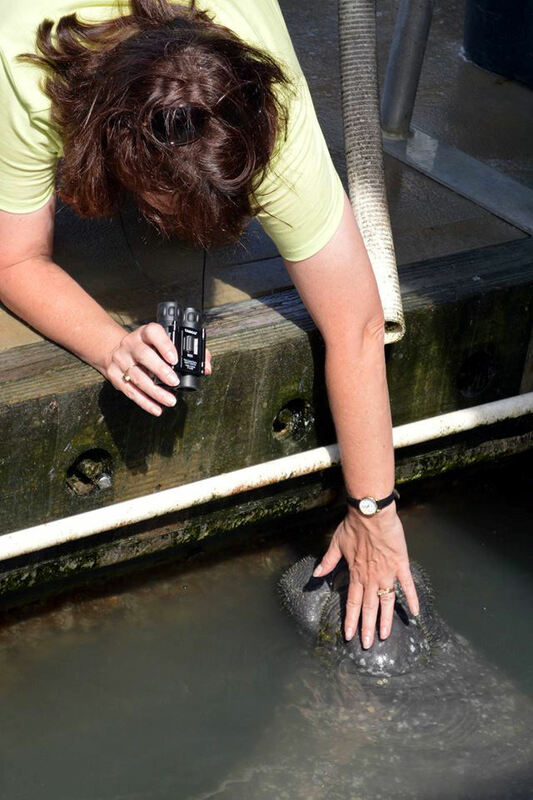 They breed on the barrier islands of the Atlantic and Gulf coasts, Mangrove Islets in Louisiana and Florida, and rocky islands off the West Coast. 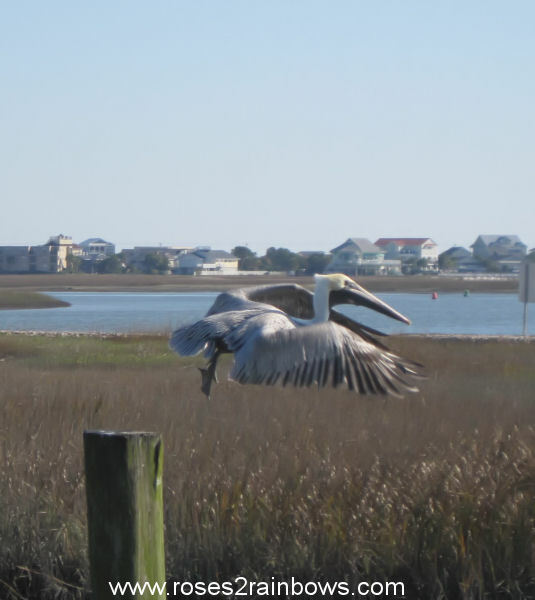 Pelicans eat mostly small fish such as mullet, anchovies and herring, diving from heights of up to 65 feet. 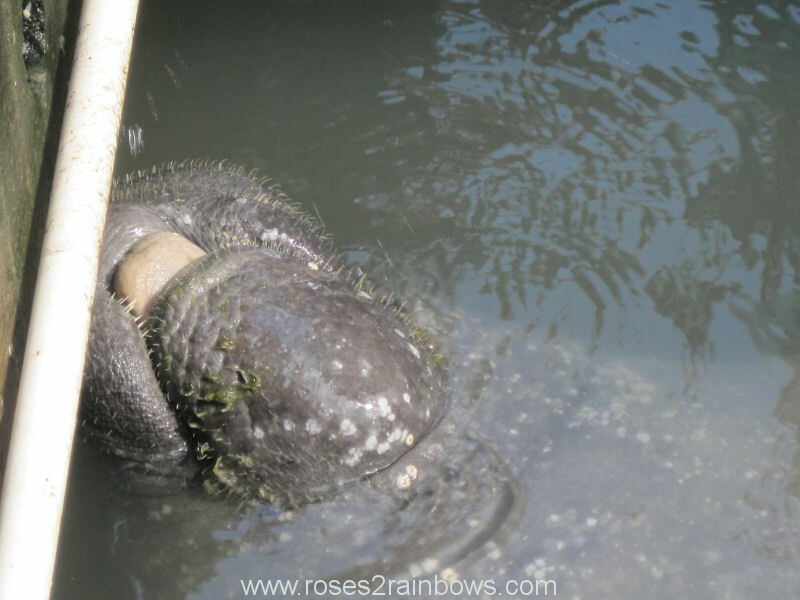 Their throat pouch can hold up to 2.6 gallons of water, which they drain before swallowing their catch. Adults are silent except during wing-jerking displays that forces air out of their lungs and produces a rather hoarse sound. Like most birds, the young call for food when they're hungry. Sometimes Nature saves the best for last! 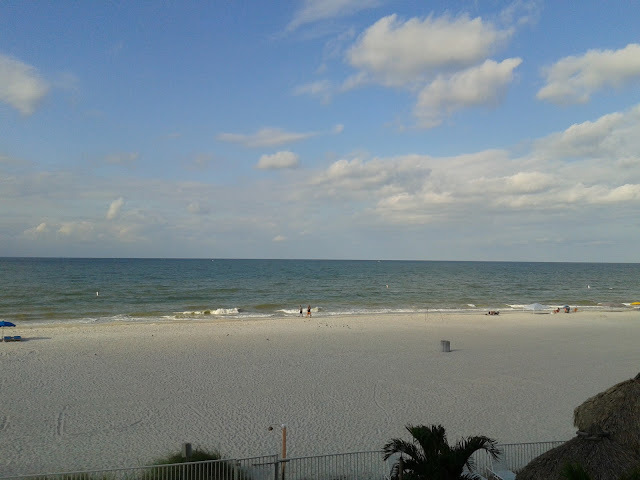 This was taken on our final night at the beach. 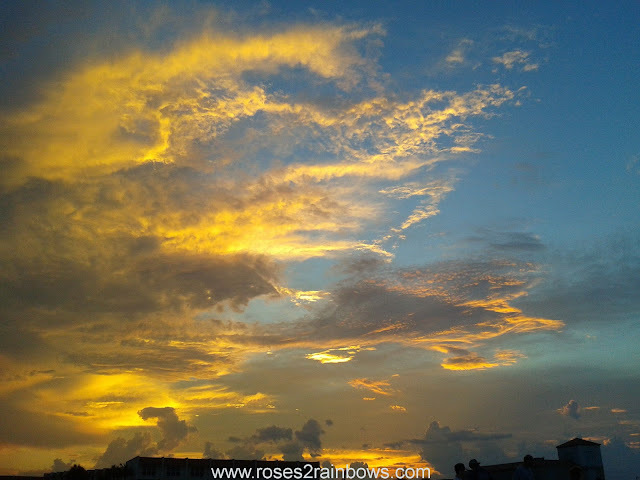 Posted for Photo Friday prompt, Clouds. 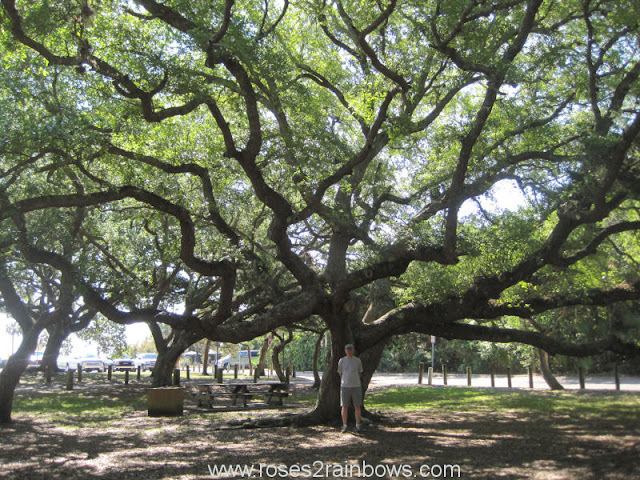 Posted for Photo Friday prompt, Trees. 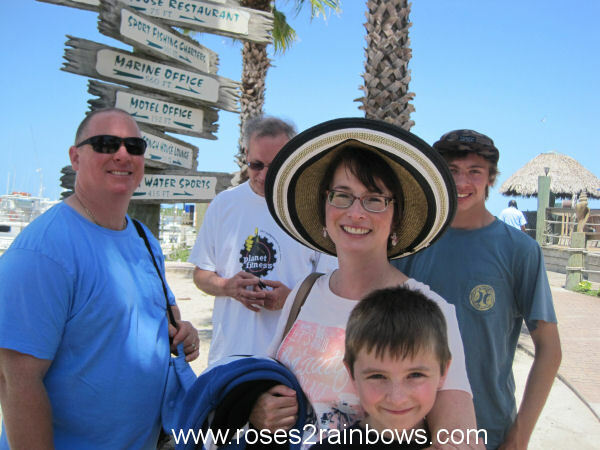 We love to vacation in Florida, and Skipper's Fish Camp is one of our favorite stops along the way. We go there for the food, which is outstanding, but we also love to just stroll around and enjoy the critters. Here are some of the turtles drifting lazily around the pool. It was a beautiful sunny day, perfect for taking pictures. 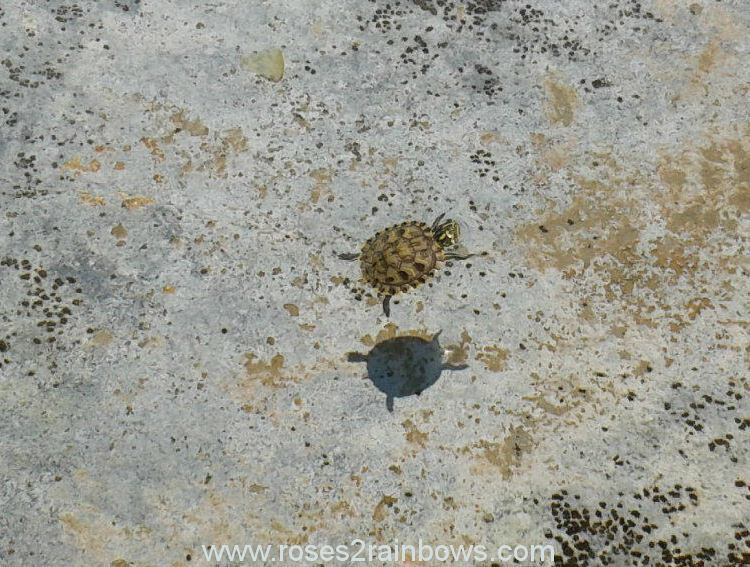 I just love the shadows cast by the swimming turtles. Hi there. Aren't you cute! 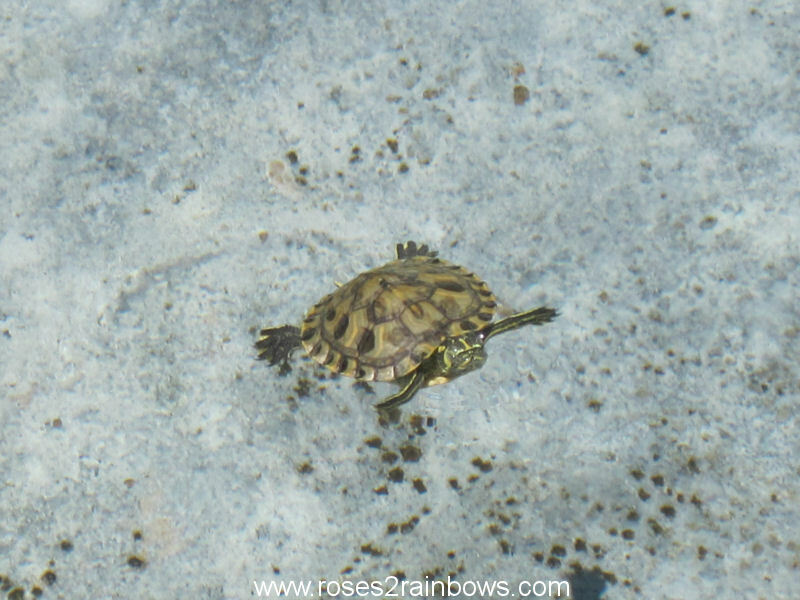 I used to have turtles when I was a kid, back in the day when you could get turtles at the pet shop. I called them Perky and Flipper. 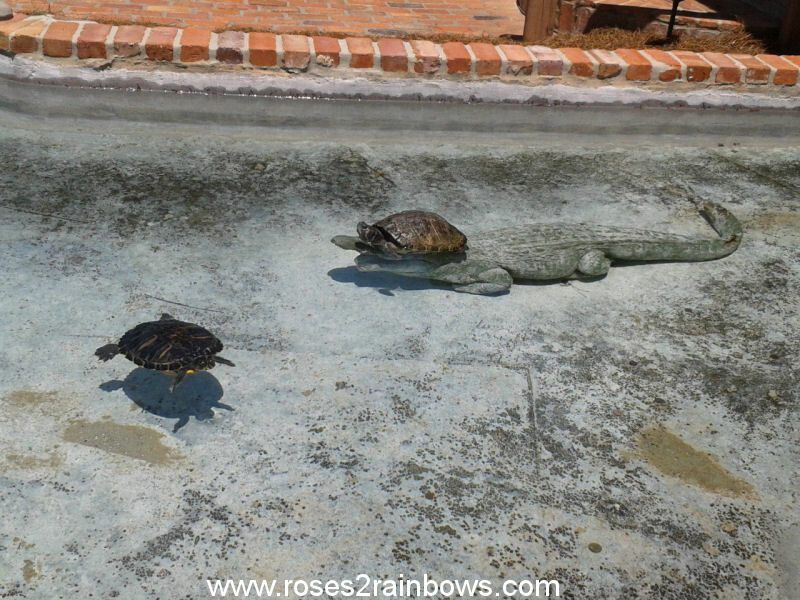 Now I just enjoy them in their natural habitat, or in this case, their swimming pool. Here's the little fellow, up close and personal. No, that's not a real alligator, although there was one in the river. I'll get to him in another post. 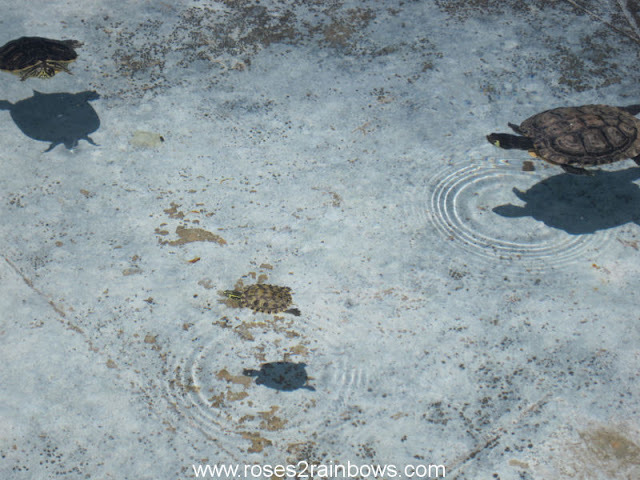 Please enjoy the turtles going round and round, and as always, thanks for visiting! 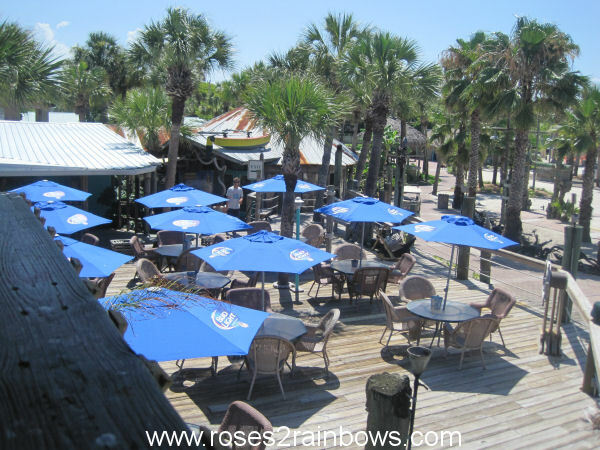 During our recent trip to St. Augustine, we had several opportunities to dine near the water. 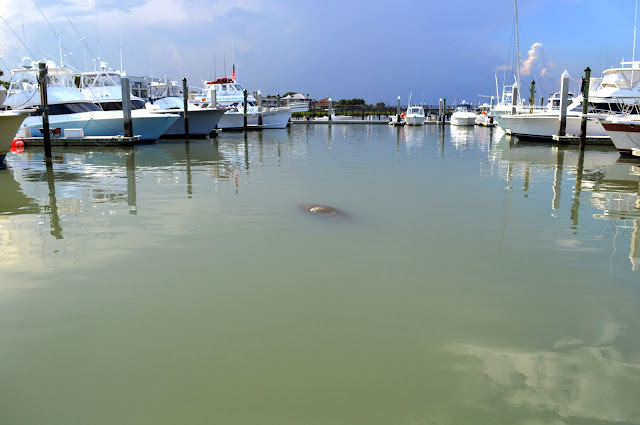 While we were having lunch at the Conch House restaurant one afternoon, this fellow was panning for his lunch in the shallows near the marina. This is the same location where we saw the manatee, pelicans, baby sharks and a sea turtle. Click the link to read about that...don't worry, I'll wait. Okay, let's meet today's special guest. This is a Roseate Spoonbill. 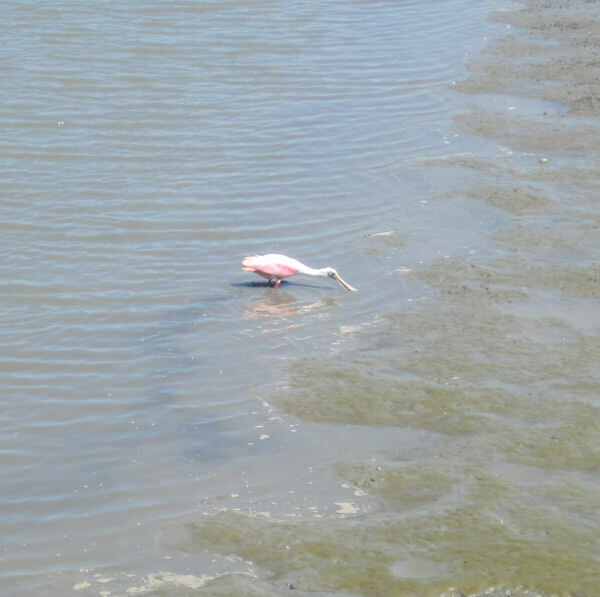 From a distance we were reminded of a Pink Flamingo, except for his flat, paddle-like bill. For more information on the Spoonbill and hear what he sounds like, click on the link. The Spoonbill is a wading bird of the Spoonbill and Ibis family, and is found in the Caribbean, Central and South America, Mexico and the Gulf Coast of the U.S. 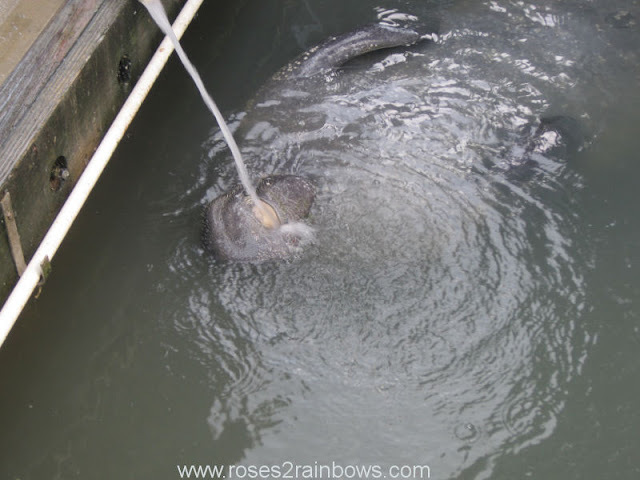 They feed in shallow fresh or coastal water by swinging their bills from side to side as they walk, often leaving a trail behind them as they sift through the mud. 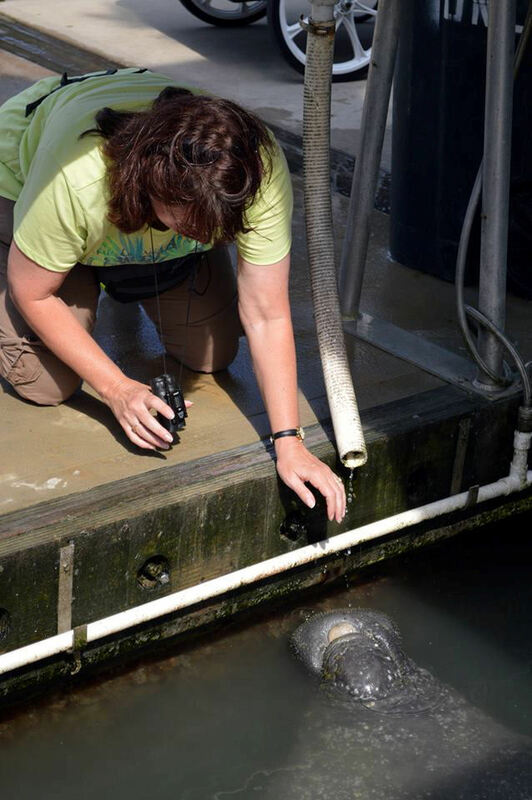 Their diet consists of aquatic insects, frogs, newts, crustaceans and fish too small for other wading birds. After lunch, I got some video of him feeding and leaving a trail in his wake. To see more of my videos, visit my YouTube channel here. The music in the video is called "Squiggly Line" by Podington Bear found at http://podingtonbear.com. I think you'll see why it is so appropriate for this video. 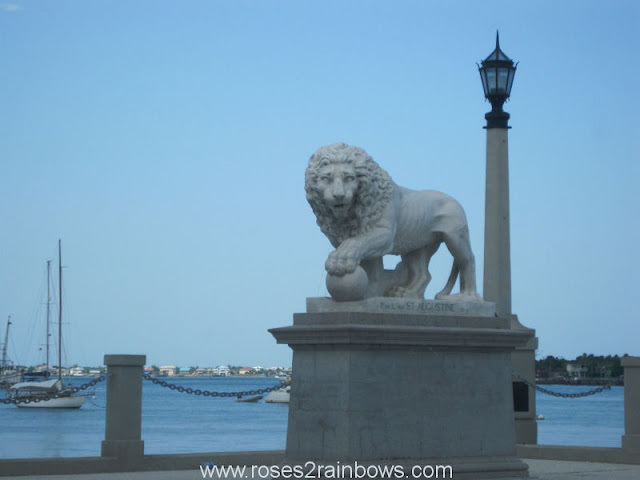 St. Augustine is the nation's oldest city, founded by the Spanish in 1565, and named after the Catholic saint, St. Augustine. Don Pedro Menendez de Aviles named the area thusly since land was sighted on the day of the feast celebrating St. Augustine. 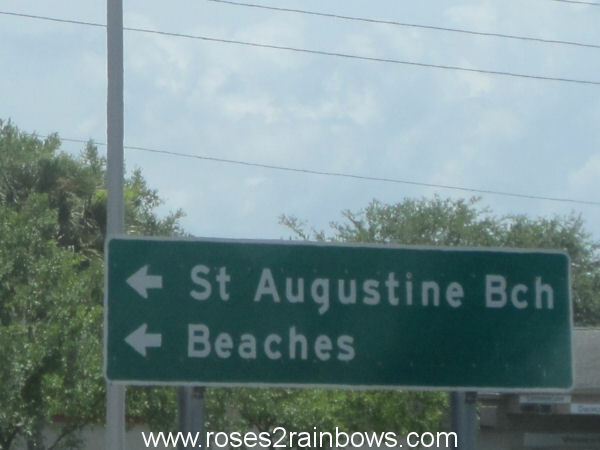 It had been many years since I had been to St. Augustine, and then we were merely passing through on our way to Daytona. I was pretty excited to get to spend time exploring the city and basking on the beach...well I don't actually bask anymore, but still it was great to hang out and watch the waves. Our traveling companions, with my hubby in the back. Everything in Twos - two couples, two cars, two kids (theirs) and two condos. Ashley and I had been looking forward to the day when we could all vacation together. This year it became a reality. 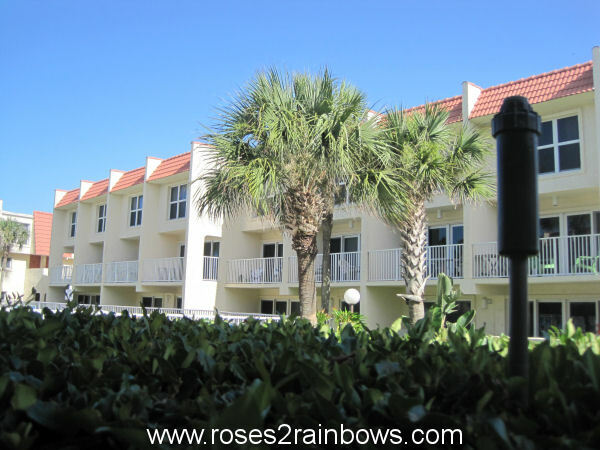 Pier Point South Condos at St. Augustine Beach on Anastasia Island. Our unit came with everything we needed, including beach towels and chairs. A big thank you to the thoughtful owners for such a well-provisioned condo. We struggled with high temperatures and high humidity so to see more of the city with less effort, we took the Old Town Trolley tour. You paid one price for three days of rides, getting on and off as much as you like. 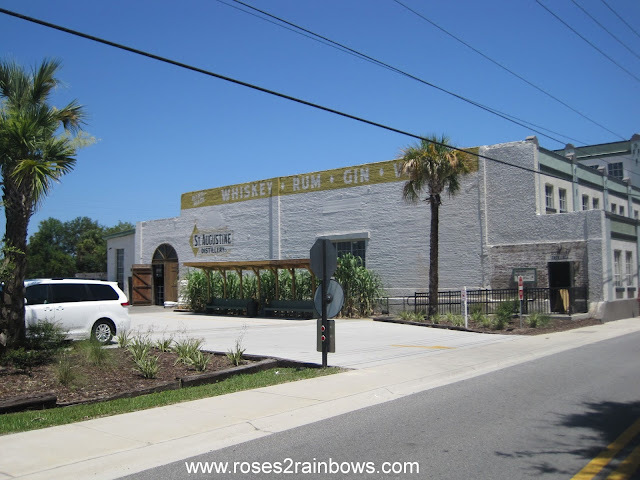 Our first stop was the St. Augustine Distillery. We all agreed that a tour, free tasting and A/C would be a welcome break from the heat. After a brief tour of the distillery, we were taken to the tasting room. There we were treated to a Florida Mule made from their own vodka, and their version of a gin and tonic, again made from their gin. Everyone was offered a sample of both the gin and vodka neat. This was my first distillery tour and spirits tasting. 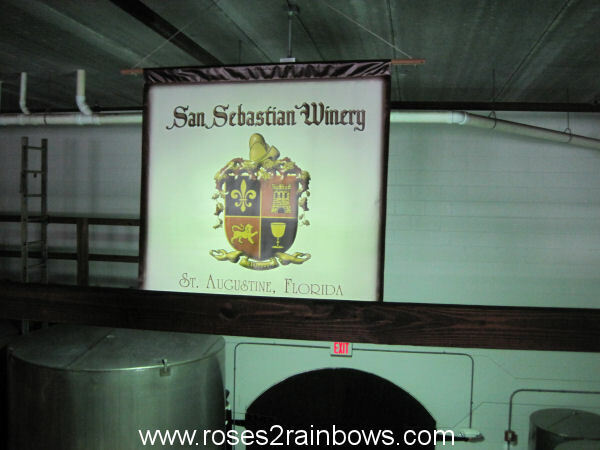 On another day we toured the San Sebastian Winery. We arrived in time for the tasting that was just starting. We were given our choice of two wines on each round and we decided I would take one and hubby the other so we could both taste each wine. The first two were a dry white made from several of Florida's hybrid grapes and a dry red described as full-bodied, but I felt it was rather light. These were the driest of the wines offered. There were several made from their Native Muscadine grape, which were sweeter. Lastly we were served cream sherry and port styled wines. 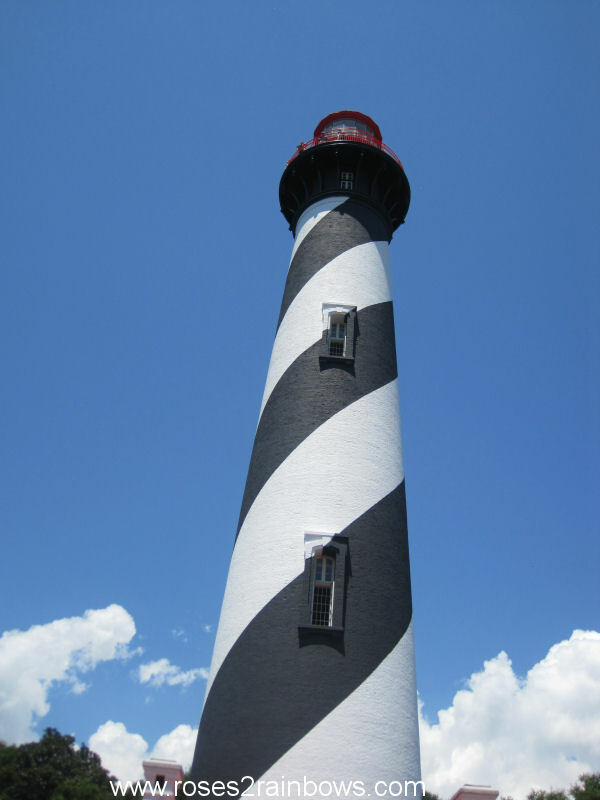 We climbed the St. Augustine lighthouse which is 165 feet tall with 219 steps to reach the circular walkway around the tower just below the lens. This tower was constructed in 1874 and was automated in 1955. 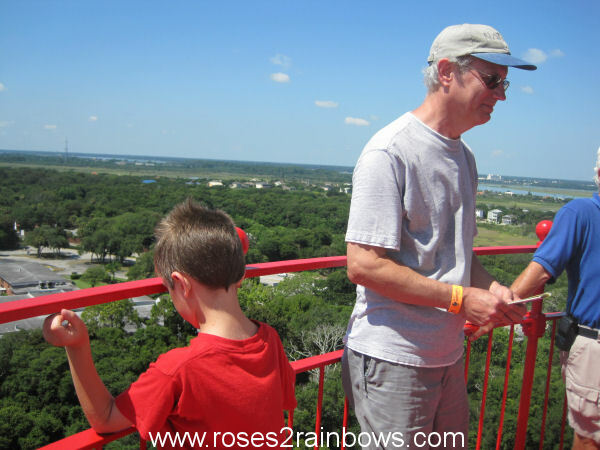 The view from the top was fantastic in all directions from the Atlantic to historical St. Augustine. At the top - all 219 steps. 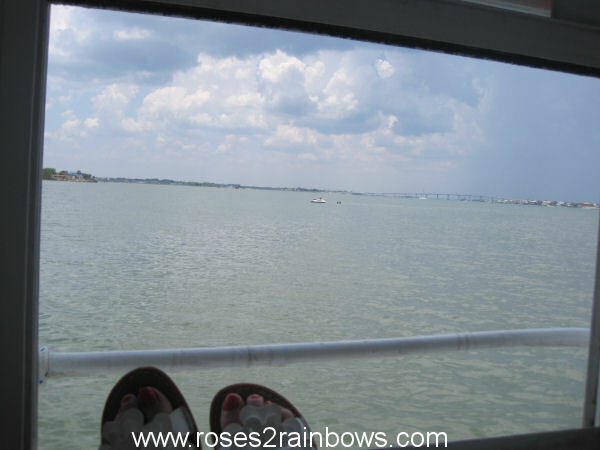 No trip involving water would be complete without a boat ride. 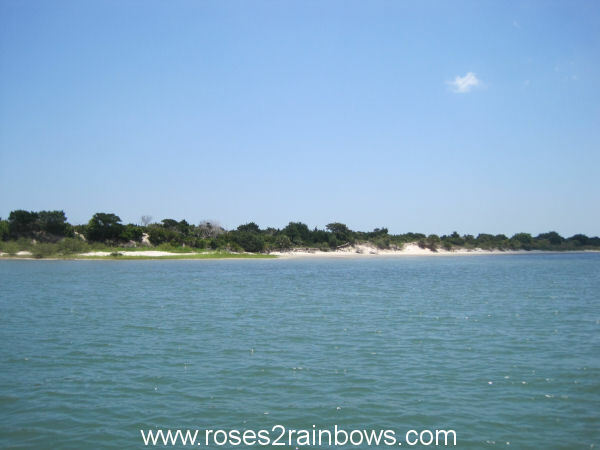 We cruised the scenic waterways of St. Augustine aboard the Victory III. Visitors have been cruising these waters since the early 1900s seeing such sights as the Bridge of Lions and the St. Augustine Lighthouse. A unanimous favorite was the Conch House restaurant. Fish tacos, fish and grits, blackened Wahoo and fried shrimp were among some of the entrees we ordered. We also sampled conch fritters, gator bites and hot wings. 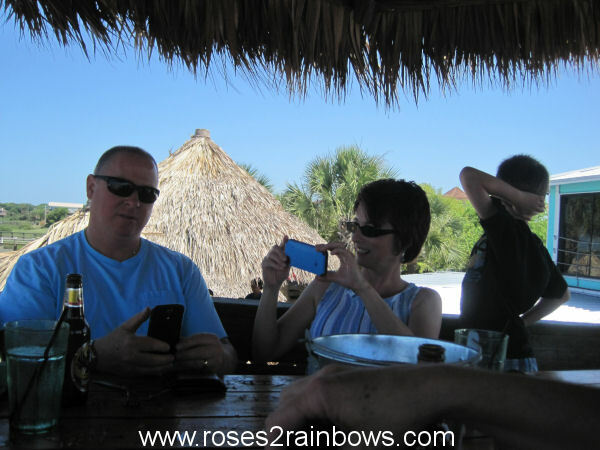 We sat at large picnic tables beneath thatched huts overlooking the marina. As we enjoyed our lunch, we watched wading birds fishing for theirs. 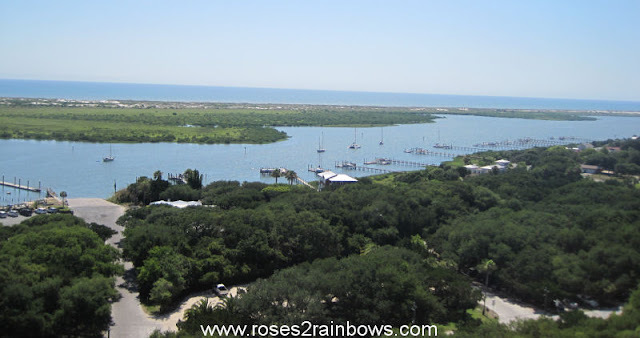 The Conch House - a view from above. 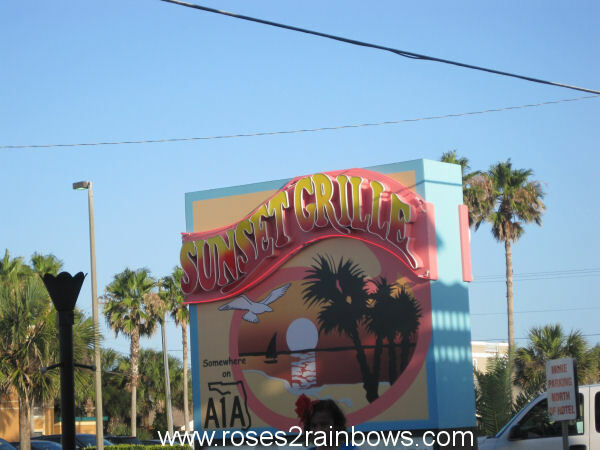 The Sunset Grille, about a block from our condo, served up tasty fare as well. We shared fish sandwiches and fish and chips outside on several evenings. Other places we ate at along the beach were Antonio's for pizza, Rita's for Italian ice (the mango was delicious), The Salt Life, and Little Margie's. In town we had breakfast at The Bunnery, and lunch at the Ice Plant (next to the distillery). Stay tuned for my manatee adventure! Until we are old and wrinkly! Good friends and good times make memories for a lifetime. It's been several weeks since I've posted, and no I didn't fall off the planet, get abducted by aliens or even swallowed up by a whale. I just took some time off to recharge my batteries, and in doing so, gathered lots of pictures and videos for blog fodder. I hope you will check back to see what I've been up to. 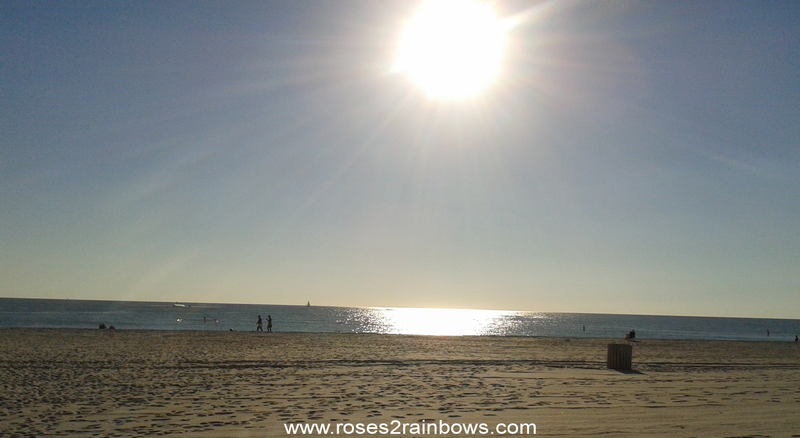 This is day four of the 20 Days of Chill writing challenge hosted by P. J. at A ‘lil HooHaa. Please join me as we share a month of reading, writing and discovery. Today's topic is Travel. 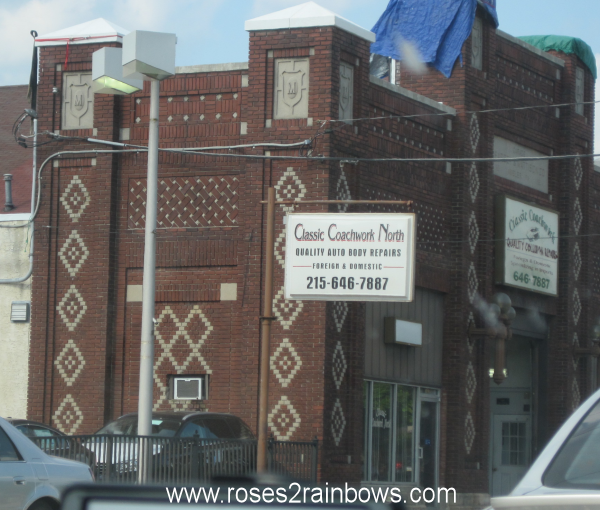 Take a trip with me through Amish Country in Lancaster County. It seems there are cornfields everywhere. One moment you are in town and you turn right, and left and you are in the middle of someone's farm. Some would say it's the best of both worlds. Small towns often have interesting names, as seen on this sign. 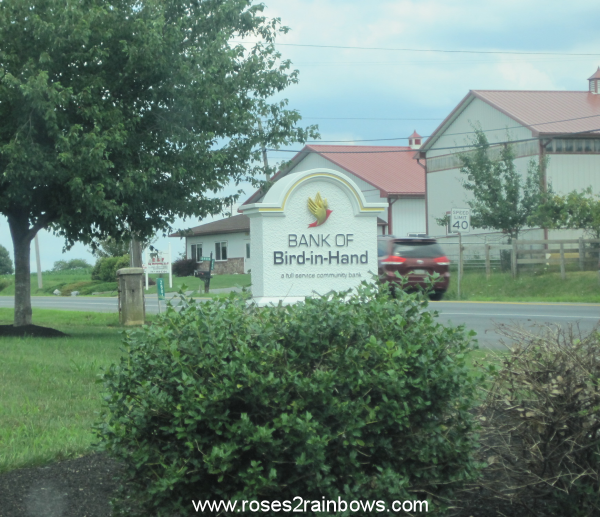 Thank you for calling Bank of Bird-in-Hand. My name is Robin. How may I help you? Are there two in the bush? 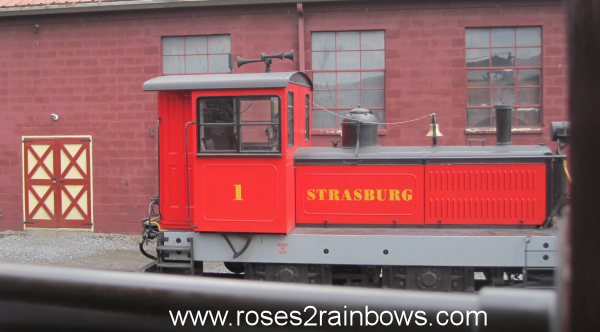 We spent the afternoon in Strasburg, and I got my first ever ride on a honest-to-goodness steam-powered train. 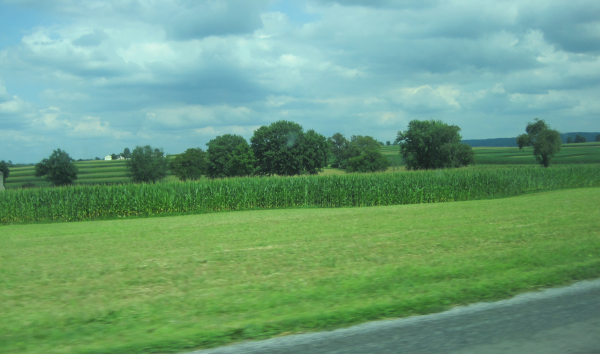 It was a short 45-minute tour through Amish Country, and yes, more cornfields. 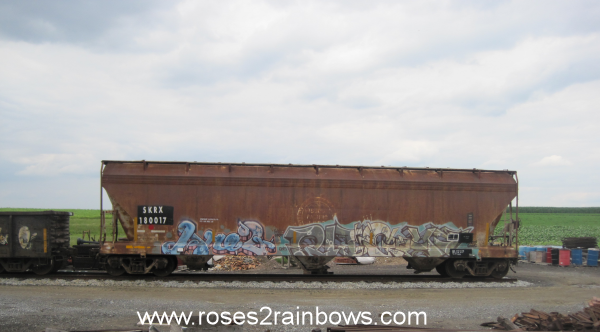 Here we have some local artwork on display on an old railroad car. Beauty takes many forms. 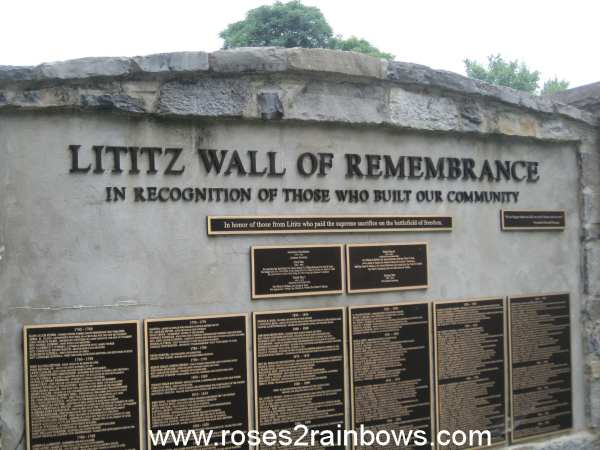 On another day we visited the Town of Lititz. The heart of Lititz consists of two intersecting streets. There are many restaurants and shops, including their very own chocolate factory (move over Willy Wonka). They also have a Wall of Remembrance to honor those who paid the supreme price for freedom. One thing you can always be sure of seeing in Lititz is ducks. Below we have Duck Island. 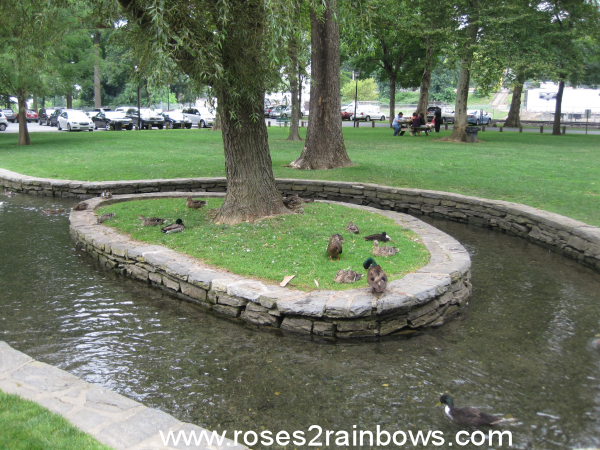 This is in beautiful Lititz Springs Park, which is over 200 years old. Can you imagine how many ducks have lived here over the years? This beautiful old building is located in Ambler, PA. We were on our way from Ephrata to Horsham, Actually we were on our way to Philly, but reasonably-priced accommodations were not to be found, so we settled on the little town of Horsham, about a half hour outside the city and took the train. 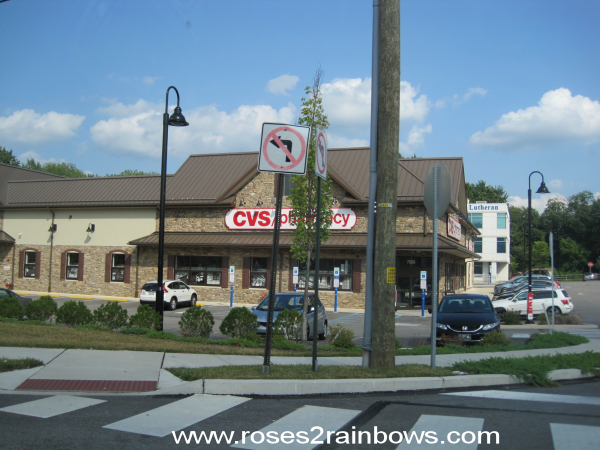 A newer building houses CVS, but I give them credit for styling the store to fit in with the small town surroundings, rather than the standard red brick of the ones in larger cities. Back in Ephrata, we visit the Green Dragon. 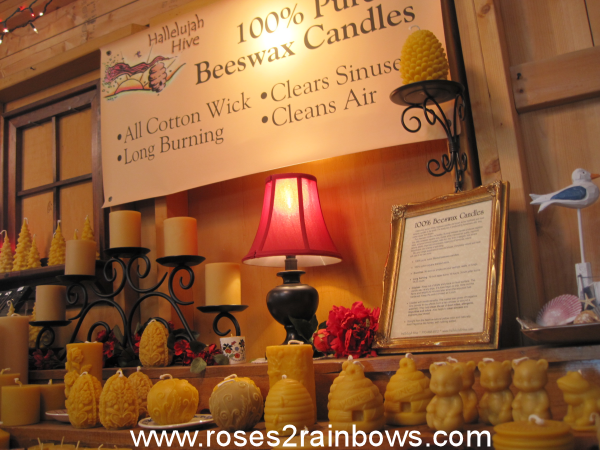 There is something there for everyone from fresh foods from local vendors, many of whom are Amish or Mennonite, to beautiful beeswax candles. Pretty and healthy too. Look at all the colorful fashions. Want sunglasses, got 'em. 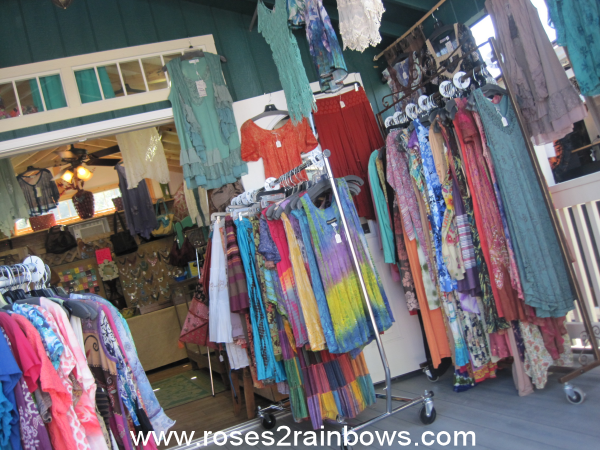 Need wind chimes, bird feeders, funny signs, just look around. You're sure to find something that strikes your fancy. Thanks for joining me on my journey through some quaint little towns. Every time I visit Ashley, I get to see another slice of the American pie - Pennsylvania style. Last month I had the long-awaited opportunity to visit Ashley and her family in the far-away place known as Ephrata, PA. We lived next door to each other in our youth, and although youth is rapidly fading into our middle years, we are still close despite the miles between us. So before I get maudlin, let's get on with the fun stuff. 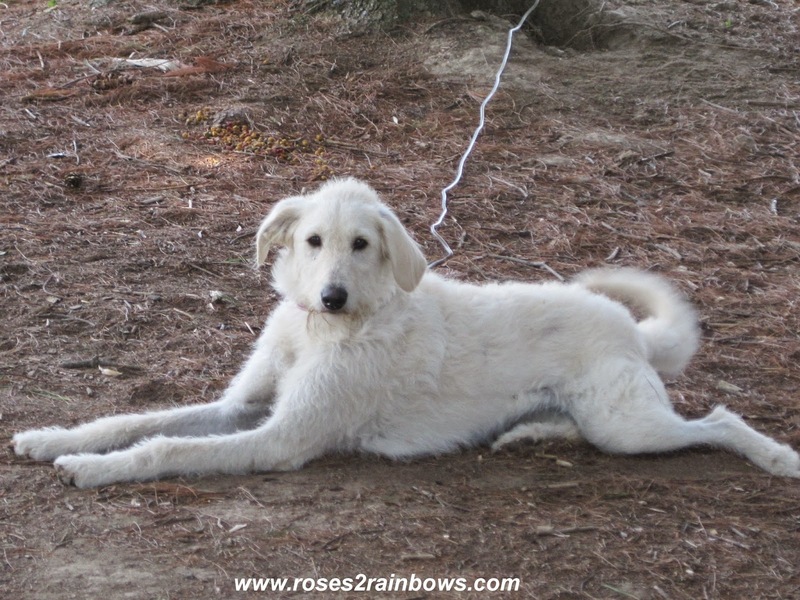 Below is Sheba, a sweet, lovable Labradoodle who belongs to Scott, her oldest son. Not only is she adorable, she is smart too. We were sitting outside with her and she was demonstrating her ability to come, sit, lay down, etc. when Ashley told Michael to have her l-a-y-d-o-w-n for a treat (spelling it out). Sheba responded by laying down. We tried it again and she did it again. We told Scott later that Sheba could spell. 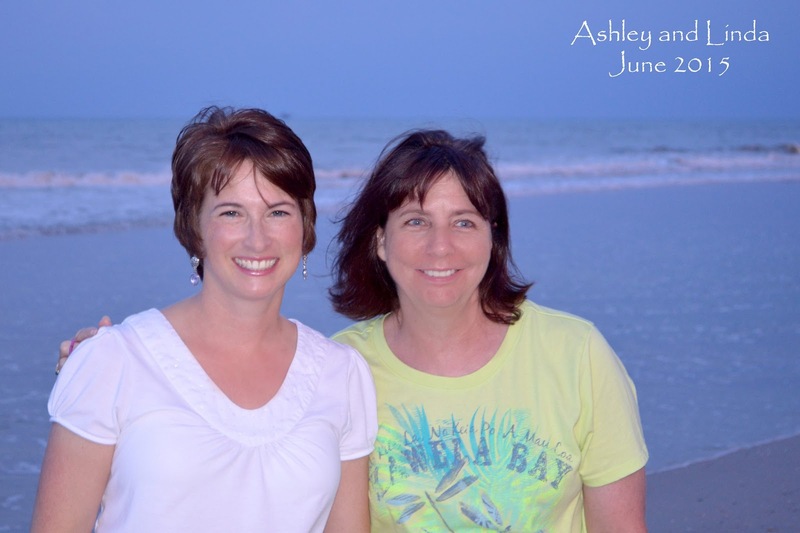 While Ashley is born and bred a Southern gal, she has taken great pride in finding fun and interesting things to do in her own backyard. She truly does bloom where she is planted. And speaking of blooms, aren't these pretty? 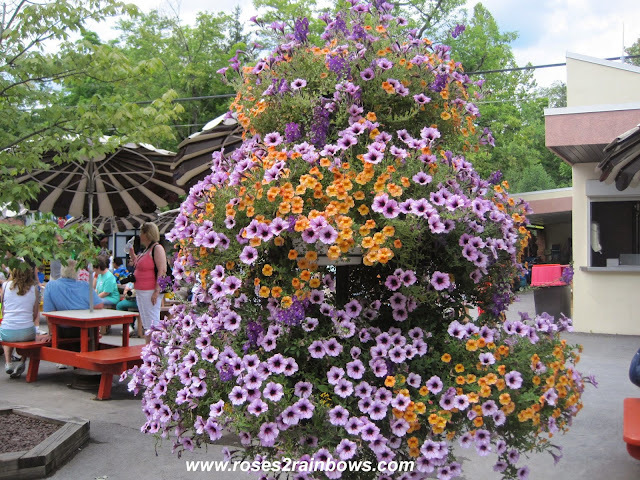 This is a flower tree at Knoebels Amusement Park, about an hour or so from their house. 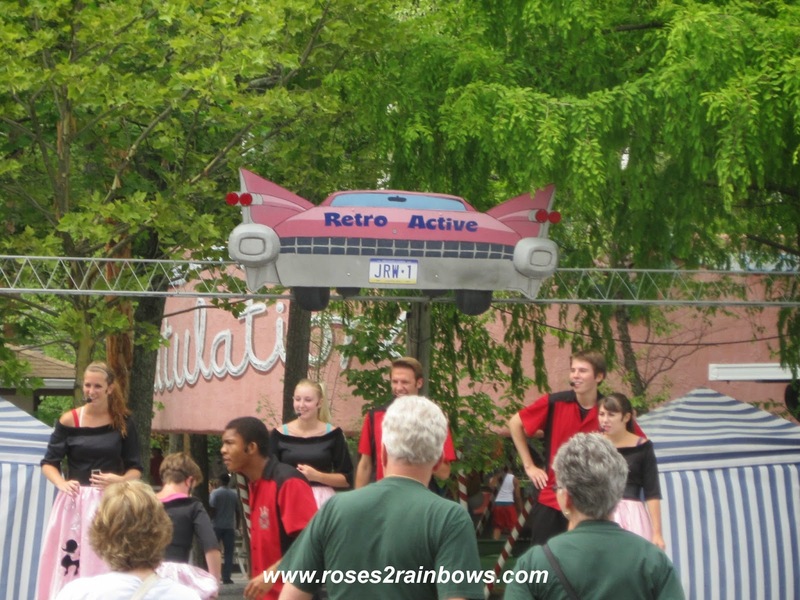 If you like groovin' to the oldies, the group singing here would be right up your alley, with such songs as Itsy Bitsy Teeny Weeny Yellow Polka Dot Bikini, Surfin' Safari and The Twist. For a different kind of music, check out the old Wurlitzer Organ tapping out a lively beat. What trip to an amusement park would be complete with a ride on good old wooden roller coaster? Well, it's not my cup of tea, but the boys enjoyed it. 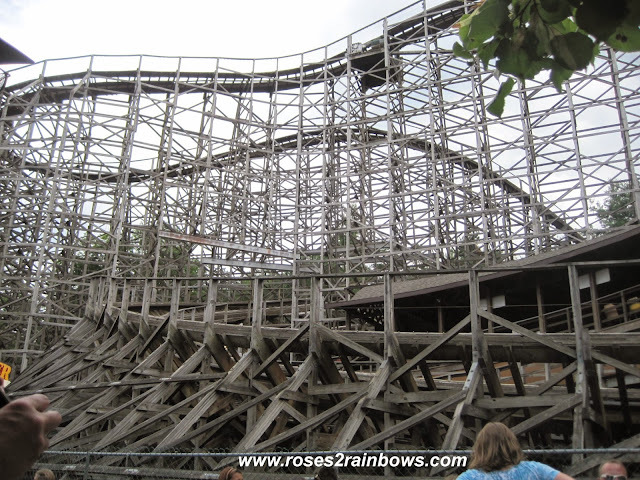 We all later enjoyed the Black Diamond ride through a haunted coal mine. 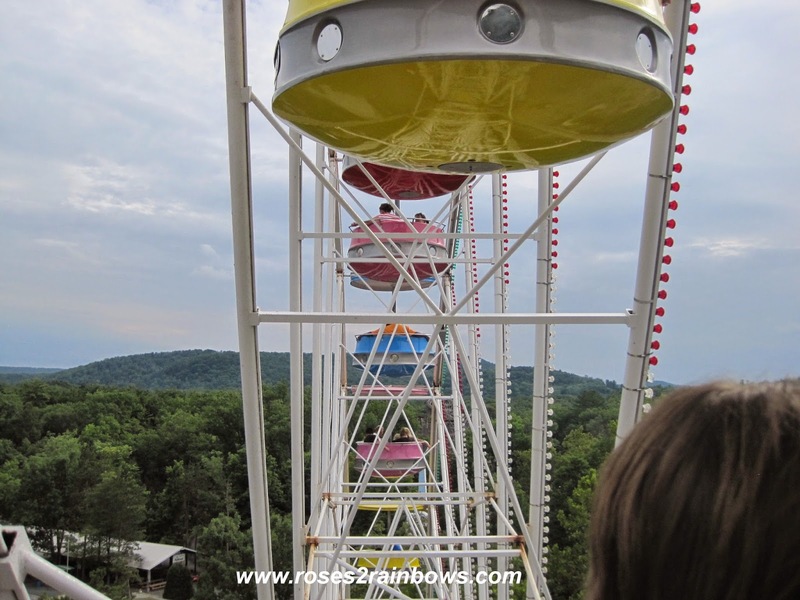 We capped off the adventure with a ride on the giant ferris wheel. It had been a very long time since I had ridden one, but it was fun and afforded us a great view of the park, and the surrounding countryside. 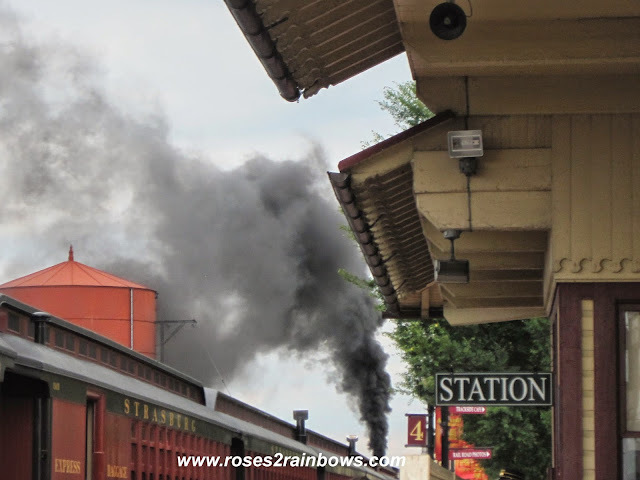 The next day we traveled to Strasburg to ride the steam train. It was a 45 minute journey through Amish country...literally through the cornfields. The engine puffed black smoke from it's coal fire and chugged along at a leisurely pace. Here you can see it at the station waiting to depart on it's next run. As many exotic places as there are to explore, there are just as many here in our own corner of the world. With every trip I take I make new discoveries, whether it is a new destination or favorite vacation spot. Many thanks to Ashley and her family for hosting us!